HOUSTON (ICIS)--April contracts for US polypropylene (PP) were assessed on Friday at a rollover, reflecting a 1 cent/lb ($22/tonne) margin increase on top of existing monomer-plus contracts. 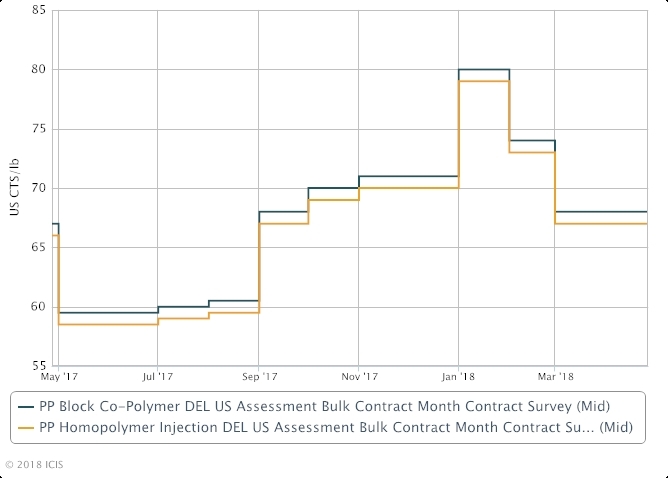 ICIS assessed April contracts for homopolymer PP injection at 65-69 cents/lb delivered in bulk and contracts block copolymer PP at 66-70 cents/lb with the same terms. US PP contracts are generally formula-based and are set at polymer-grade propylene (PGP) values plus an adder. PP producers separately sought margin expansions of 3-5 cents/lb for April, while another seller is seeking a margin expansion of 4 cents/lb for May. Sellers were able to achieve separate margin expansions of 0.5-2.0 cents/lb on April contracts and will continue to push for full implementation of their margin expansion targets in the coming months. April margin increases were supported by limited supply, following LyondellBasell’s force majeure declaration from its 638,000 tonne/year plant in Lake Charles, Louisiana. Sellers of both imported and domestic material said that they have been receiving increased customer enquiries for this month. Demand, meanwhile, was heard to be healthy as converters have been raising operating rates for the past several months, following two consecutive monthly declines in PP contracts totalling 12 cents/lb. This has generated more favourable margins for converters, following a period of depressed operating rates during a sustained run-up in PP prices during the second half of 2017. Upstream, April propylene contracts settled at a decrease of 1 cent/lb from March, marking a third consecutive month of declining contract prices. Spot prices were firmer on the week, with PGP offered at 50 cents/lb and refinery-grade propylene (RGP) quoted at around 36-42 cents/lb.